Fixed surveillance cameras have traditionally been a major factor in helping companies and government agencies in protecting vital infrastructure from crime and the threat of terrorist attacks. However, by their own definition, they are limited in their utilisation just by the fact they are fixed. Mobile surveillance is the next generation of surveillance and is a great asset to complement existing fixed surveillance systems. It helps companies protect property and people by live streaming from a camera that is mobile. For example, encrypted live streaming can be achieved from a body cam, from a drone or from a vehicle. They can be placed on public transport including buses and train to provide real time video feeds. It allows security and law enforcement to see inside locations and to get cameras to where they are needed quickly and efficiently. Protecting vital transport links such as airports, train stations and other public institutions has never been easier. Live video can be securely streamed in full broadcast quality via multiple 4G connections back to an existing ONVIF compliant Video Management System within a control room. Latencies are typically under a second. With less human intervention in logistics, more computer intelligence is demanded, often from remote, central command. An economy of scale is required to make the investment in digital logistics possible. One-off deliveries won’t succeed in creating profitability. Therefore AI, encrypted broadcasting with minimal latency, remote guiding combined with accurate tracking on GPS, all help ensure a successful delivery. 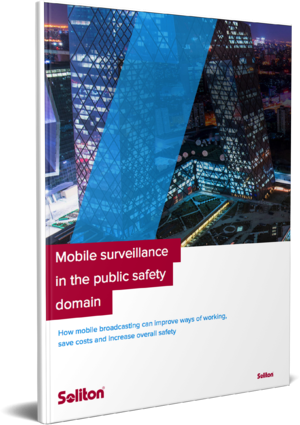 In terms of mobile broadcasting, in order to create secure, remote logistics, prevent sabotage or stealing, the IT security needs to be augmented. In the case of drone delivery, we would recommend live video mobile broadcasting for each logistics operation, which would ensure that we can see where the packages are going. Although many would initially be piloted and therefore requiring live stream, to ensure buildings, electricity wires and other obstacles are avoided. Even pre-programmed GPS drones would benefit from live streaming, to ensure the safe delivery of products. The way Soliton has deployed the H265 hardware-based encoder results in at least 50% more efficiency in bandwidth usage compared to traditional solutions. For example: a 3 Mbps Soliton H265 stream provides the same video quality as a stream doing 6 Mbps in H264. The 4G Bonding algorithm has also been improved dramatically compared to the traditional 4G bonding systems. 4G bonding of different cell networks creates another level of security as the video signal is fragmented though different carriers, so they could only hack fragments. The overall result is a much-improved picture quality, even with less latency, which is typically under half a second. It is even possible to have 2-way communication between the camera team and the editorial people with minor delay via the ZAO. The 4G bonding system, ensures that live, encoded video transmissions would be distributed between multiple networks to the Milestone or HDView systems. This collectively adds another level of difficulty to an already complex system to hack. With large projects such as The Map Project sponsored by the SAS airlines, which aims to give more domestic homes an actual address rather than a description (third tree past the village shop). It currently can take hours to find a house especially the last kilometre as street names stop existing or being used. As more and more people get mobile phones, the ability to register their GPS location and start using an actual address empowers them to start businesses and raise finance for their initiatives. The project hopes that corporations will continue to sponsor the project, as they are able to improve logistics to these addresses. It is very important for emergency services for example to be able to find these addresses if childbirth is going wrong. As people get over their nervousness with registering, they can be incentivised for example with a free delivery of a home birthing kit. The largest chance of current success with drone delivery is seen in using drones to deliver medicine in remote areas with poor roads. When faced with inadequate infrastructure in remote areas, the desire to use drones to deliver seems appealing. Dominos pizza sent their first pizza delivery by drone in 2016. Soon after Amazon tried drone delivery. To get this far they have overcome many challenges, which were sceptically not thought possible. However, there are still challenges to face such as economies of scale and avoiding bumping into people and non-mapped obstacles (need real-time visual guides and sonar). 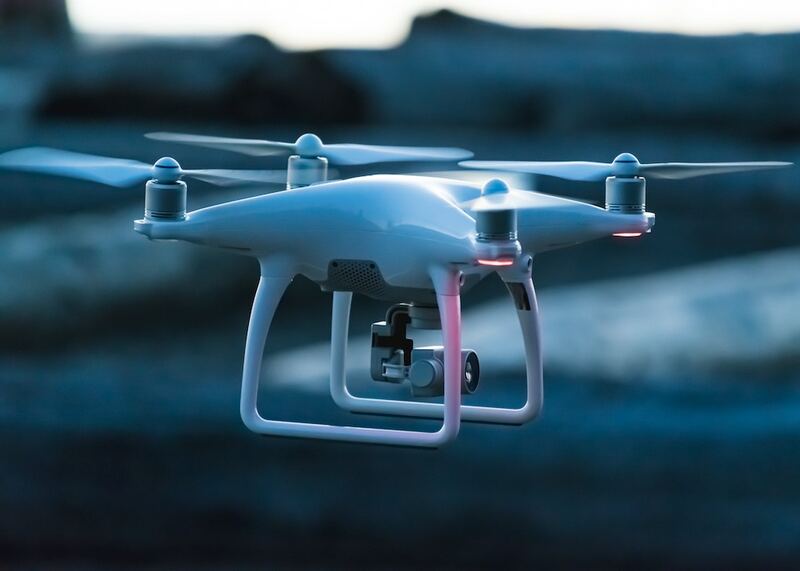 The uptake of drones for private use, has pushed the governmental GPS mapping for the enforcement of avoiding flight routes. It has also developed the legal responsibility of risk of crashes and accidents. Amazon as one of the largest online retailers in the world has recently spent 1 billion Euros on a smart video doorbell called Ring. The reason for this investment was one final piece in the puzzle in their full order to customer supply chain. Customers can easily ask their virtual assistant Alexa to order products with their Amazon Echo product. However, the actual logistics via traditional methods, provides a gap in their delivery which they wanted to plug. Amazon customers can use their Ring product to accept their home delivery remotely, or to speak to the delivery man and ask for it to be delivered by neighbours. They can also remotely unlock the door to let the delivery man in, via their remote opening smartlock (an Amazon product). Amazon has also acquired Whole Foods Market for 11 billion euros. This means they will soon be able to incorporate the full buying cycle (including food) online ordering, to delivery within your house remotely. The lack of human intervention from the voice command ordering to letting the delivery be taken inside your house is a major disruptor in shopping convention. Data loggers are present to ensure that the recording and tracking of all trains crossing junctions occurs. As junctions and stations are the most dangerous areas of the tracks for collisions and incidents, these normally are linked via CCTV in cities and the footage is linked back to the command centre. There is, therefore, less need for live broadcasting from the train engine room, as recorded video evidence can aide judiciary evidence gathering from incidents, collisions and accidents. However, as freight trains increase in length, the manoeuvrability of the trains is vastly reduced. The idea of reversing a train becomes vastly limited as people can’t see behind them – there’s no rear-view mirror on a 2 mile-long train. It’s too far for WIFI or bluetooth to work or to link up reverse camera’s by cable, so the idea of using a broadcasting device to the engine room seems very suitable. The cameras can link up to satellite to ensure with multiple sim cards on one decoder, to ensure a continuous and high-quality video with minimum latency to the train driver. To protect the ticket collectors and train staff travelling, body cams can be used and the footage sent live to the train driver’s booth. This way the mobile and remote staff are able to easily visually communicate and back-up support can be summoned real-time. Shipping freight already have excellent GPS and GPS dependent apps such as MarineTraffic, which can show real-time all the locations, type of freighters, what cargo they are transporting etc. It would be interesting to couple this information with live-broadcasting from the frigates. This video streaming can check the safety of the crew, feed information back to the local guards, collect judiciary evidence of poorly loaded freight ships, or illegal dumping or pollution and reduce the current threats of pirates by combining mapping and GPS tracking of suspect ships with video footage. In docks, sadly there are instances of illegal transportation or storage in cargo blocks. If the dock staff were using mobile body cameras, they would able to film, document and map illegal activities. As terrorist activity heightens and airport security increases, it’s possible that terrorists are looking for new weapons to commandeer. It becomes more difficult for known terrorists to work their way through airports, but cargo currently has lower security control measures than passenger transport. Just as a truck was used to devastating effect on the Nice promenade and two passenger jets in New York causing the 9/11 attacks, a cargo plane can cause just as much damage, especially freights with highly volatile cargo. Real-live streaming with no latency from the cockpit, encoded and direct to airport control can ID and check pilots, map course against GPS and view any unauthorised activity on board. It could ensure that no cargo planes are used in an unauthorised way or to be used in terrorist activity. Footage from bus journeys has been used to see attacks on bus drivers and prosecute, however little is done real-time as recordings have been used rather than live, encrypted broadcasting. The addition of a live-stream broadcasting tool could dramatically enhance safety and provide speedier back-up and assist immediate arrests with live evidence gathering for court. Soliton Systems is providing innovative input into self-driving cars to enable vehicles to be automatically moved away from disaster zones such as natural disasters or civil unrest. This can include benefits of reducing congestion and accidents through human error under extreme stress. Automated cars are predicted to increase traffic flow, which is needed in evacuation situations. Self-driving cars can also provide enhanced mobility for children, the elderly, disabled and the poor. Travelling in war-ravaged countries is highly dangerous. Sometimes a drone can be used ahead of the convoys to survey the land ahead, with the combination of sending back live stream videos and live thermal imagery videos, to reduce the risk of ambush by being detected in advance. A great leap in technology would be metal detectors from drones, as this would allow the detection of landmines ahead of convoys. Who know if this is possible, but it wouldn't it be a good idea? With live streaming, the team would be able to send detonation robots ahead to the mapped GPS coordinates transmitted from the drone, coupled with live video imaging to direct and ensure sucessful detonation of suspect mines. Pipelines and gas lines traverse continents and countries. They can cross great rivers and lakes. The age and junctions of these pipes can also vary significantly. By surveying the area by air, they are also able to also use GPS mapping and live streaming for security purposes. Gas companies can improve quality of the gas delivered by searching for contaminants such as liquids in the gas pipes. If the gas pipe needs to be shut down as contaminants are found, the cost of cleaning out the section is great, but nothing compared to the loss of revenue for the loss of productivity. The gas companies want to pre-empt this risk, as much as possible, by putting live streaming cameras inside the pipes. These cameras are monitored remotely, given the vast distances involved.